This little pup is showing off his playfulness by balancing on his back legs and wagging his tail. 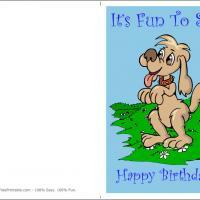 Cute Dog on a Field free printable birthday card will entertain your loved one with his happy little face. He is perched on a grassy hill dotted with white daises. A pale blue sky accentuates the darker blue fun letters letting someone know you have enjoyed wishing them a wonderful birthday. There is room on the inside for your own words of best wishes and the like. If you prefer, use our custom print option to include a printed personal message along with some added animal images too! 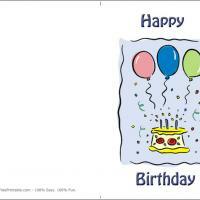 Send this cute dog birthday card to your dog lover friend. These adorable free printable cards feature a cut puppy in a studded collar standing up and begging for scratches and probably a piece of the birthday cake! These printable birthday cards are not just great for pet lovers, they're great for just about any child as there is no denying that most kids like dogs! Hey, it may even be perfect for older friends who also love dogs. 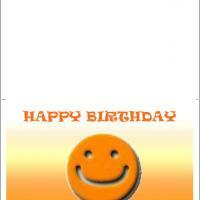 Write your own message on the inside wishing good times for the birthday too. Your friend will surely keep this card forever. Don't you love how a dog will happily greet you when you come home? They just start hopping around and dancing on their back legs begging for a pat on the head. 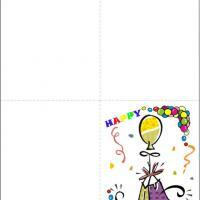 Cute Pup on a Field free and printable birthday card shows how much fun it really is to wish someone a wonderful day of birthday cheer. The little brown dog is decked out in his studded collar and standing on his back legs with a happy little puppy-dog grin. 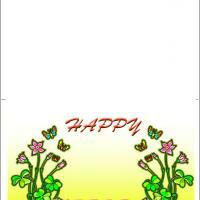 The grass is green and layered with little white daisy blooms for a bright springtime day in the sun. The sky is blue and sets the stage for the happy lettering across the front to express how you feel about sending your loved one a birthday wish!